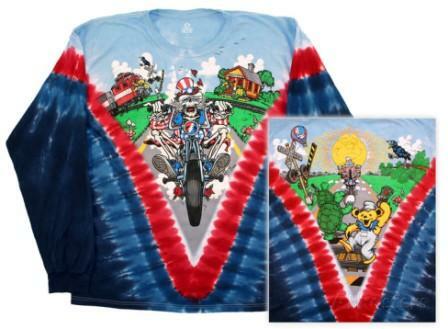 Here's a new Grateful Dead Long Sleeve Tie Dye that comes from Liquid Blue. The short sleeve version is so popular, they decided to print a run of long sleeves for those chili days and nights. On the front is Psycle Sam on his motorcycle, and the back features a terrapin turtle and a dancing bear. Officially licensed Grateful Dead merchandise.